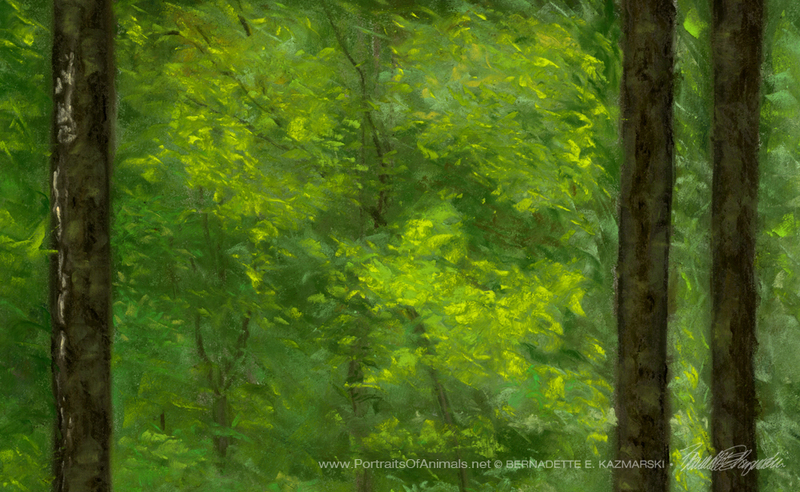 Paths I Have Walked, Pastel is 16″ x 28″ in soft pastel on 2-ply acid-free natural illustration board. The original and prints on paper and canvas are available. 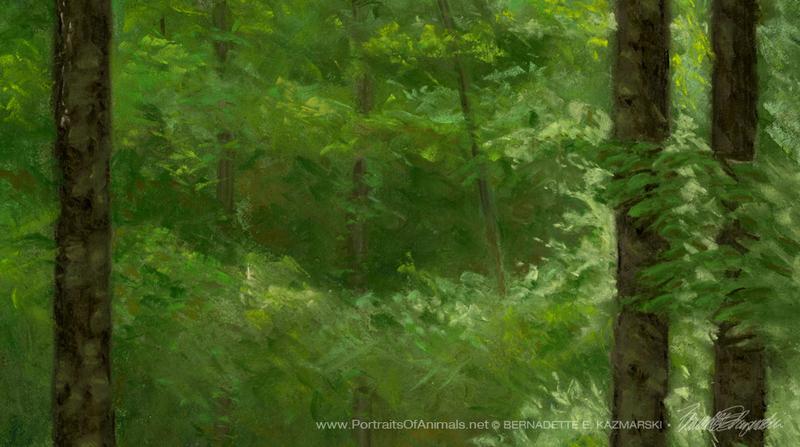 This painting was the featured art for 2016: Sun Shadow Ice & Snow, Seasons on the Panhandle Trail and depicts me walking through a favorite section of the woods along the trail where the sycamores and maples grow straight up toward the sky from the flood plain and it feels like a green cathedral. I’ve never done a self-portrait of any sort. At my first Panhandle Trail exhibit in 2014 I set the standard for exhibits to follow by walking through the woods to Robinson Run to get water for my big enamel cooking pot and walking back gathering wildflowers for my display. 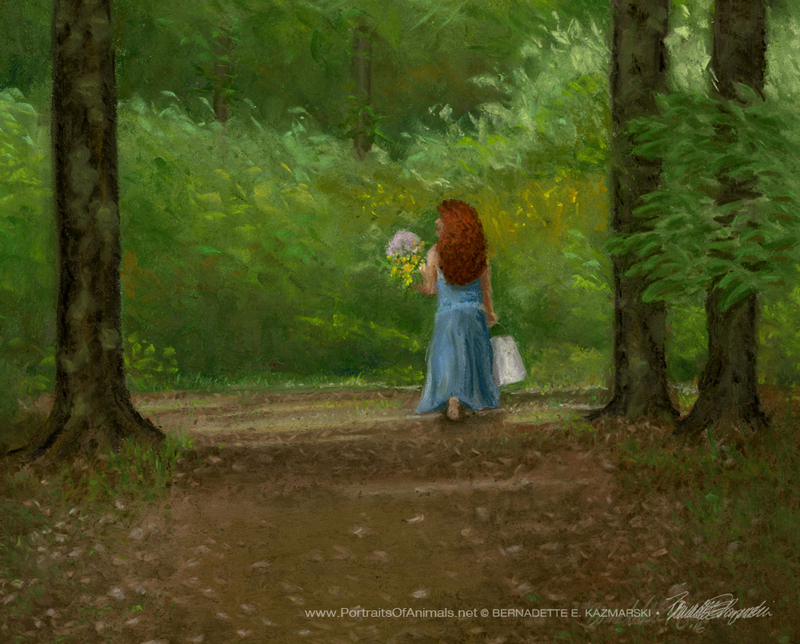 I don’t usually think of myself as a subject in my landscapes but liked the idea of myself walking along a familiar path dressed to meet the public in my festival clothes, carrying flowers and a bucket of water. Because I have so few photos of me and find I both like to see them and need to use them in promotions, I asked a friend to photograph me in this activity after the show. They quickly became some of my favorite photos, and I’d always wanted to do a painting or two from them. 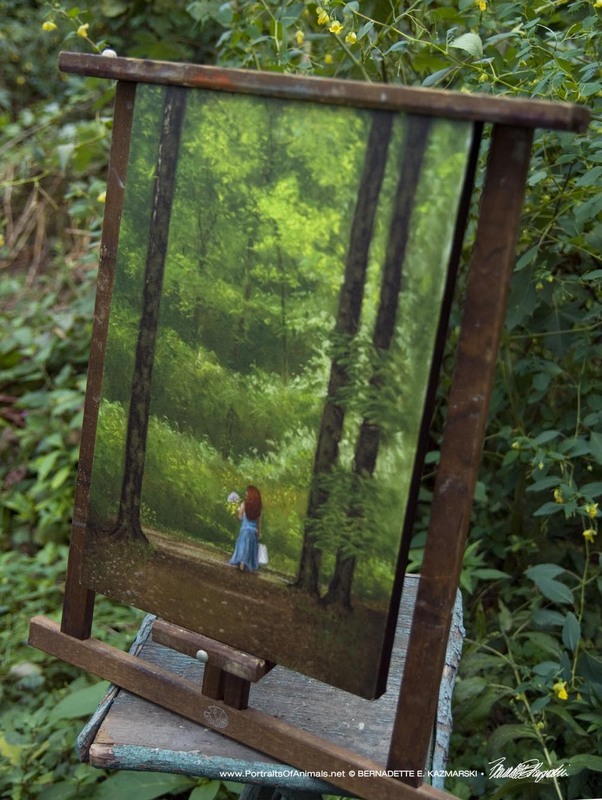 I have never been the subject of one of my paintings, but kept visualizing this painting, especially when I had come into a really beautiful vintage frame that would be perfect for my idea. 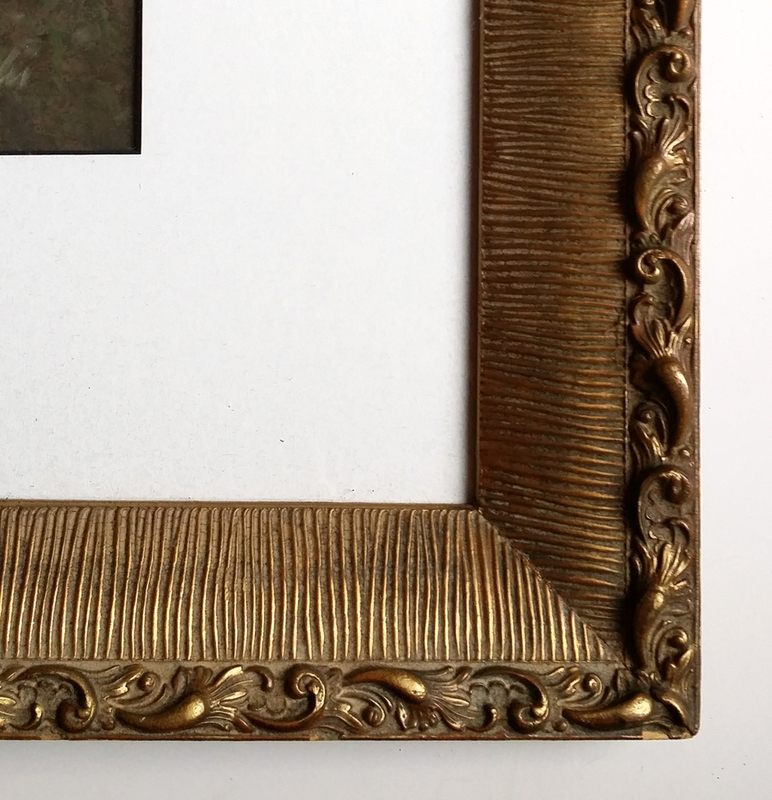 I added touches of different gold finishes to the details of the frame and it all came together. A decade ago I called my first poetry ready “Paths I Have Walked” because so much of the inspiration for my poetry, other writing art and photography came from finding paths all over the hills and valleys where I grew up and following them wherever they led, and also following some other paths out of this place, giving me experience and a perspective. I had used this title on my 2011 poetry book using Dusk in the Woods on the cover. 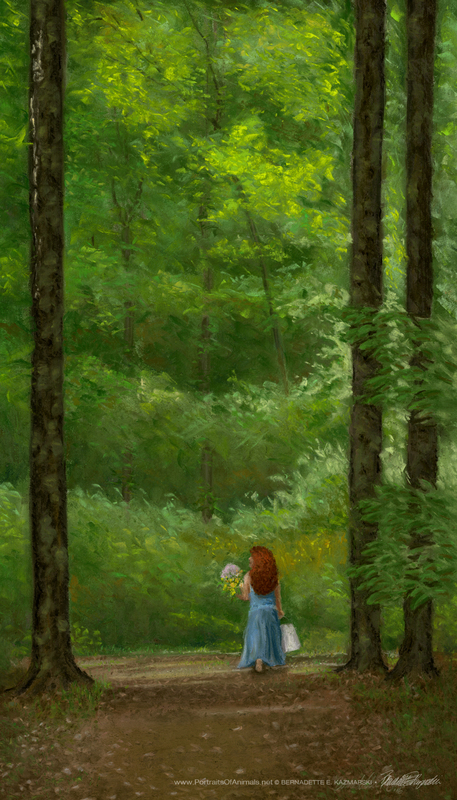 When I cast about for a title for this painting it came to mind fairly quickly; I also have future plans to set up my writing website and I’d planned to use one of the photos from the series of me in the woods so it all ties in together. I will write more later about the symbolism of this piece in my life today, but for now I will just say it feels entirely suitable. I have the feeling we will be seeing much more of this painting, and though I feel a little self-conscious that it’s kind of a self-portrait I’m glad I’ve finally appeared in my own art. Somehow that becomes necessary after time. The frame is 24″ x 36″ solid wood with a detailed carved finish to which I added a gold wash and a green gold wash. The mat is 4″ wide, soft yellow-green flecked with a black core. This entry was posted on August 31, 2016 by Bernadette.